The combination of housing market events and the profit motive of mortgage lenders turned trillions of dollars of household debt into a huge safety net. Household debt had been increasing during the 1980s and 1990s, but the rate of increase was extraordinary in the years leading up to the recession. By 2007, household sector debt had reached 114 percent of the nation’s personal income – more than $14 trillion. The change was almost entirely due to accumulation of home mortgage debt. Normally, home mortgages are fully secured by a residential property, and when a homeowner fails to make the scheduled payments on time, the lender can seize the property and sell it to recover its principal, interest and fees. When the lender has this valuable foreclosure option, borrowers overwhelming either make their home mortgage payments on time or sell their property in an orderly fashion to obtain the money to repay the mortgage lender, even in cases when the homeowner is unemployed. When residential property values plummeted in 2008 and 2009, a number of residential properties were suddenly “under water” — worth less than the mortgages they secured. In those cases, the lender’s foreclosure option was no longer valuable – selling the property would be likely to yield too little money to cover principal, let alone interest and fees. Lenders needed a way to estimate which borrowers would still pay in full and a way for other borrowers to work out a mortgage modification that would give them an incentive to pay at least a bit more than their homes were worth. Naturally, a borrower’s income is a factor considered – borrowers with high income can be expected to repay more than borrowers with low income. Thus, a partial solution to the lenders’ collection problem is to insist that high-income borrowers pay more of the mortgage amount due and allow at least some low-income borrowers to pay less. From this perspective, the lenders’ desire to maximize debt collections (after the collapse of residential real estate values) causes them to create a kind of safety net program that gives low-income people more help with their housing expenses (much the way the federal food stamp program gives low-income people more help with their food expenses) in the form of modified mortgage payments. To quantify the size of the loan modification safety net and its changes over time, I estimate the amounts that “home retention actions” (as the federal government calls these mortgage modifications that allows people to stay in their homes) actually changed mortgage payments from the original mortgage contract, which specified only payment in full or foreclosure. To estimate those amounts for 2008-10, I first measured the number of residential properties in each quarter receiving loan modifications, lender permission for short sale or lender permission for deed-in-lieu of foreclosure. Next, I multiplied the number of transactions by a $20,319 average value of each loan modification (a typical modification reduced monthly payments by $400 for a minimum of 60 months; at an annual discount rate of 7 percent, that’s a present value of $20,319). I do not have data on the number of home retention actions for the years 2006 and 2007, but I assume the dollar value of discharges those years were, as a proportion to discharges in 2008, the same as total mortgage loan discharges by commercial banks. Because the home retention actions are necessary primarily when homes are worth less than the mortgages they secure, the amount discharged by home retention actions is much less in 2006 and 2007 when residential property values were still high. During 2010, mortgage lenders discharged more than $70 billion of mortgage debt through home retention actions. Seventy billion dollars for one year is small in comparison to the total amount that homeowners were under water but is more than the spending by the entire food stamp program for that year. The last row of the table displays discharges on other consumer loans, such as credit card debt. Those discharges are smoother over time because they are not directly tied to the housing cycle but still totaled more than $70 billion in 2010. The combination of discharges of other consumer loans and discharges of home mortgages by home retention actions was almost $150 billion in 2010, which exceeds the peak spending for entire unemployment insurance system. Bankers deserve a lot of blame for getting us into this mess, have dipped far too deeply into the United States Treasury to help themselves, and have been far too slow to modify mortgages. For these reasons, it’s remarkable that their own selfish pursuits have forced them to create a safety net of sorts that rivals the amounts spent by public sector safety net programs. Professor Krugman is reiterating his claim that "income security" programs grew solely because of the recession. He is incorrect: only a small fraction of that growth is due to the recession, the rest because of legislation making the programs more generous. Inflation-adjusted government spending on unemployment insurance (UI) and food stamps (SNAP) has more than doubled on a per capita basis, and most of this growth is due to changes in eligibility rules, and increases in payments per eligible person, rather than increases in the number of people who would have been eligible under pre-recession program rules. By 2009, the UI program was absorbing a larger fraction of earnings lost due to unemployment than it did in 2007, with the majority of its expenditure made pursuant to federal expansions since 2007. Indeed, among persons aged 25 and over, it was more common to experience unemployment without government help before the recession than it was since 2007. Perhaps legislation changes were the "right thing to do" given the recession. But Professor Krugman is pretending that the legislation changes did not occur. Despite the severe recession, relatively few people saw their living standards fall into poverty, thanks to the social safety net. According to the Center for Budget and Policy Priorities, the percentage of the United States population living in poverty increased by 0.6, to 15.5 in 2010 from 14.9 in 2007. The poverty measure refers to resources available to families, accounting for the taxes they pay and subsidies they receive. Considering all that happened in the economy over those three years, 0.6 percentage points is quite a small change. Measures of the poverty rate typically change more than that over any three-year interval. The study found that many people were technically above the poverty line in 2010, although their incomes were low, because they received government assistance like unemployment insurance, food stamps and refundable tax credits. The government assistance permitted them to have living standards above poverty, even while their market incomes were below the poverty line. Were it not for government assistance, the study found, the recession would have pushed 4.2 percent of the population into poverty, rather than 0.6 percent. One interpretation of these results is that the safety net did a great job: For every seven people who would have fallen into poverty, the social safety net caught six. Perhaps if the 2009 stimulus law had been a little bigger or a little more oriented to safety-net programs, all seven would have been caught. Another interpretation is that the safety net has taken away incentives and serves as a penalty for earning incomes above the poverty line. For every seven persons who let their market income fall below the poverty line, only one of them will have to bear the consequence of a poverty living standard. The other six will have a living standard above poverty. The safety net was not as effective before the recession began. As I explained in my last two posts, government assistance programs have not only supported more people but become more generous, thanks to changes in benefit rules since 2007. Of course, most people work hard despite a generous safety net, and 140 million people are still working today. But in a labor force as big as ours, it takes only a small fraction of people who react to a generous safety net by working less to create millions of unemployed. I suspect that employment cannot return to pre-recession levels until safety-net generosity does, too. The Department of Agriculture’s food stamp program, now known as the Supplemental Nutrition Assistance Program, or SNAP, provides money to low-income households for the purpose of buying food, often in conjunction with cash assistance programs. Adjusting for inflation, the program spent more than twice as much in 2010 as it did in 2007, before the recession began. The Department of Agriculture found that the food-stamp spending increase “is likely attributable to the deterioration of the economy, expansions in SNAP eligibility, and continued outreach efforts.” Of particular relevance for the SNAP program is the fact that the poverty rate increased 18 percent, to 153 per thousand in 2010 from 130 per thousand Americans in 2007. At least two eligibility expansions have occurred since the recession began: work requirements were lifted from April 1, 2009, through Sept. 30, 2010, and monthly income limits were 10 percent higher in the 2010 fiscal year than they were in the 2007 fiscal year, an increase about twice the rate of inflation over that period. In addition, the American Recovery and Reinvestment Act increased maximum benefits by 13.6 percent, and the minimum benefit increased in October 2008. Increasingly, potential program participants have been given the opportunity to apply for benefits on the Internet. The declining economy alone, under the previous rules, would have raised the spending on food stamps by 18 percent. But the revised provisions, enacted largely in response to the recession, are responsible for a greater share of the increase. The following table breaks down the program’s spending growth into three components: deterioration of the economy, relaxed eligibility rules and increased maximum benefits. The top row of the table is actual program spending for 2007 and 2010, adjusting for inflation and population. The second row of the table estimates the program’s hypothetical spending growth with 2007 eligibility rules, by assuming that real spending per capita increased since 2007 only in proportion to increases in the poverty rate, plus the 13.6 percent benefit increase of the American Recovery and Reinvestment Act. The last row assumes that real spending per capita increased only with the poverty rate. Under either scenario, the hypothetical spending increases are significant but well less than half of the actual spending increases. Over all, the table suggests that most growth in spending on SNAP is due to changes in eligibility rules and increases in payments per eligible person. The program’s spending would certainly have grown if benefit rules had remained as they were in 2007, but much less than it actually did. And those more generous provisions are now likely to be here to stay, even if the conditions that prompted them abate. It’s commonly assumed that unemployed people not receiving unemployment benefits have been unlucky enough to go without a job for so long that their benefits have run out. But often more important are limited work histories and a low propensity to take benefits that are available. Historically, many unemployed people have not collected unemployment payments because of ineligibility, lack of awareness or simple unwillingness to collect benefits. But some of those patterns changed during the recent recession. The chart below shows the number of unemployment compensation beneficiaries per unemployed person, for people 16 to 24, people 25 and over and all people 16 and over. This ratio can be less than one for all of the reasons mentioned and because some unemployed people may exhaust their benefits sometime during the calendar year. 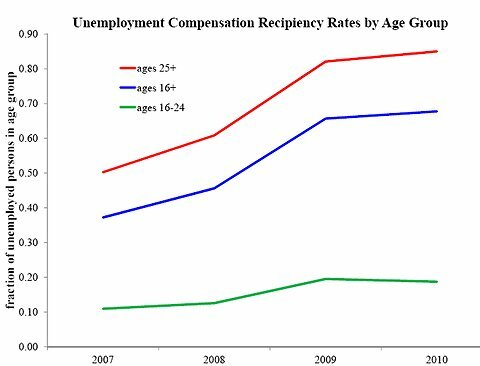 Not surprisingly, more than three-quarters of young unemployed people do not receive unemployment compensation, in large part because they are much less likely to have the employment history that is required for eligibility. Young people are disproportionately represented among the unemployed, and their limited work histories are the primary reason why a large fraction of the unemployed does not receive benefits. More striking is the increase to 85 percent from 50 percent among people 25 and over. Before the recession began, about a quarter of unemployed people that age had been unemployed for more than 26 weeks, when unemployment benefits were typically exhausted. The remaining quarter of the unemployed did not receive benefits for a variety of other reasons: they may not have been interested in or aware of benefits, or they may have been ineligible because they quit their jobs (rather than lost them). By 2010, unemployment was lasting much longer, but the time for receiving benefits had increased even more. Ninety-two weeks was a typical unemployment benefit period in 2010 (in some states it was 78 weeks, in others 99 weeks), yet only 12 percent of the unemployed 25 and over were unemployed that long. That means as many as 88 percent of the people that age who were unemployed could have received benefits. That 85 percent received benefits tells us how rare it was for eligible people to forgo benefits during the recession. This absolute decline in nonparticipating unemployed suggests that people are more willing (equivalently, less unwilling) to collect unemployment benefits than they were before the recession began. Unemployment insurance is known for its ability to expand eligibility as a recession gets going, whether through the “extended benefits” that take effect at given jobless rates or through legislative action beyond that. But an adjustment almost as important has occurred in the labor force itself: during the recession, people increased their propensity to take advantage of available benefits. 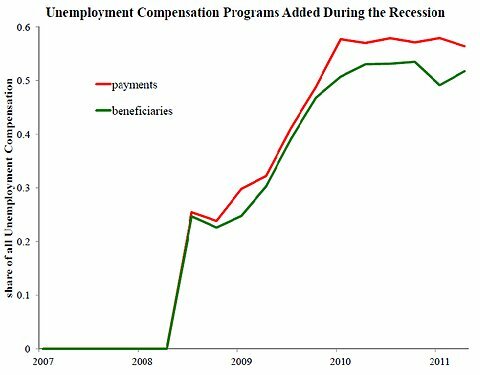 However, the unemployment program has also become more generous since 2006. Before the recession, an unemployed person in a state without high unemployment would often exhaust benefits after 26 weeks; that is, the program would stop paying after the 26th weekly benefit, even if the beneficiary was still without work.